Anna of Freiburg believed in Christ and was baptized on the confession of her faith. In my church today that would be cause for celebration, but in Anna’s part of Europe in 1529, hers was a radical act punishable by death. Anna was arrested, sentenced to death by drowning, and her body was later burned. Shortly before her death, as Anna prayed to God, I’m struck that she did not pray for relief from her suffering or to avoid her fate. Instead, her prayer is mainly concerned that she might persevere and not be separated from her God. I can’t imagine being in Anna’s position or praying her prayer. How could she meet suffering with such apparent calm resolve? How could she pray to be “cheerful and glad” in suffering? Would her response even be considered healthy today? What do you think? I’m both mystified and challenged by her example and words. I call upon you from the depths of my heart. even in my sorrow and distress. Keep me cheerful and glad in my sufferings. through all anguish and pain, even to my death. that I may not be separated from your love. O my Father, let it be done through Jesus Christ. Amen. Soon after her prayer, Anna was led away to be executed, trusting in God even to her death. Anna was one of many martyrs throughout history. 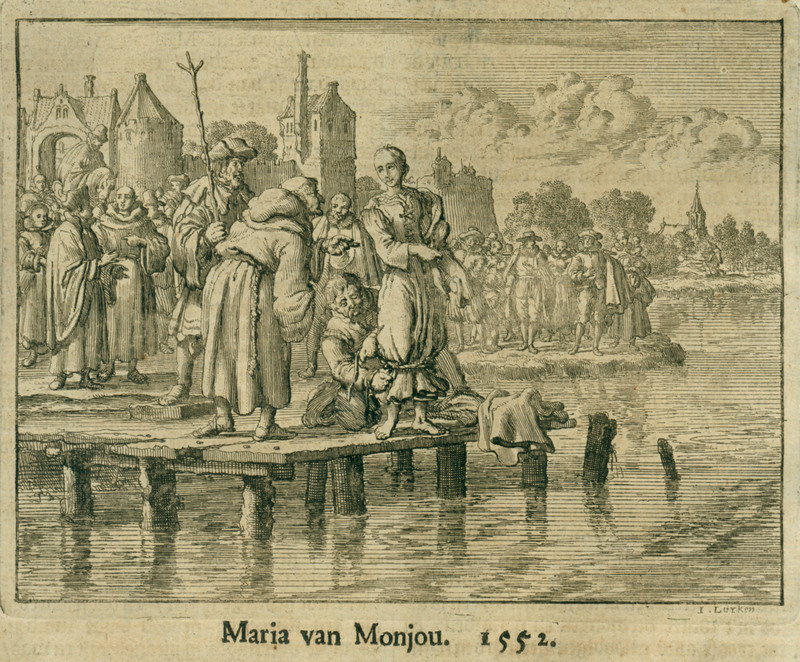 This etching from the Martyr’s Mirror shows Maria van Monjou who, like Anna, was also executed by drowning. Next postWriting FAQ: where do you get your ideas?